Brownie is a yummy snack usually loved by one and all. Who does not love to indulge on these heavenly delights once in a while, right ? 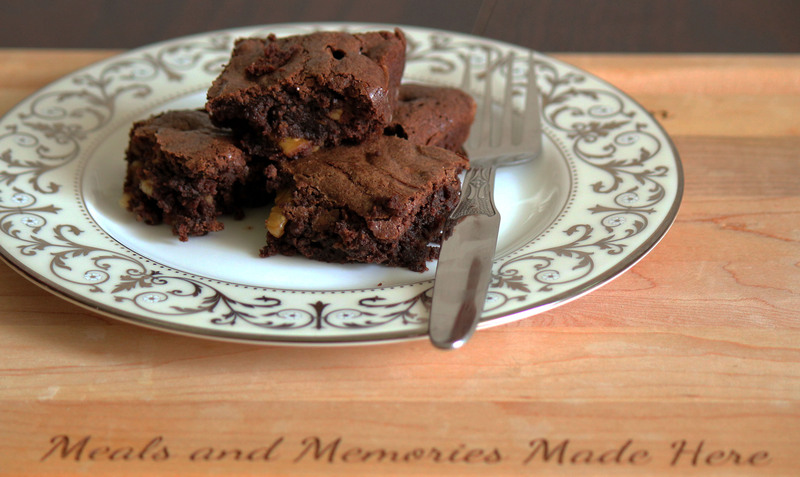 I especially love brownies with walnuts.This was my first attempt in making it at home and was pleased with the way it turned out.I looked at couple of recipes online and one of the things I learnt was brownies can be either cakey , fudgy or gooey with a crackly top. I was looking to make a fudgy brownie and that meant avoiding baking soda or baking powder so it does not rise.Here is my version of the brownie after reading through various versions of recipes .This recipe is a no-fail one and turns out yummy! A delicious fudgey dessert with a crispy, crackly top made with unsweetened cocoa powder ,sugar, butter, all purpose flour and walnuts . Grease the baking pan with cooking oil spray and line with parchment paper. Sprinkle a little flour on the halved walnuts. Combine melted butter, oil and sugar together in a bowl and whisk well for about a minute , this gives a nice crackly top. Add the eggs and vanilla and beat for another minute until it gets a pale and lighter color. Add flour, cocoa powder , walnuts and salt gently stirring the dry ingredients until just combined .Do not over beat at this point as it will affect the texture of the brownies. Pour the batter into the greased pan and smooth the top out evenly. Bake for about 25 minutes until the centre of the brownies no longer jiggles and on testing with toothpick it comes out dirty . Cool in the pan and slice into small brownie squares. Thank you so much Prashasti! It is looking so yummy and decadent…do goey and fudgy..loved it..awesome pictures.. Thank you so much Anshu ! it was indeed gooey and fudgy! Thank you so much Anusha! They are yum. I personally adore walnuts in bakes. 2nd best thing is almonds. Thank you so much Vidya! Yes same here , love a crunchy something in my bakes! Thank you so much Misabella! Love your super moist cake! yay! so happy for you 🙂 congratulations on your milestone ..am glad to be the 200th follower !! That would be fantastic, am sure she would love it! Thank you for the comments and stopping by! Yummy!.Looks so delicious .Is there any other way to bake it except oven ? Yes indeed I follow this all the time and so glad you liked it as well. Thank you so much Deepa, appreciate it!